No doubt you're already looking for ways to improve your website and increase conversions. As a business website, the easier and more streamlined you make anything, the more likely you are to see those visitors turn into customers. That goes for a lot of things on your website, particularly the contact form. If you rely on website contact forms to drive sales, or even if you just rely on them for customer service, having a handy form in your sidebar can make all the difference. Website visitors won’t have to scroll up and click on your contact page for more information. They won't have to hunt around for an email address or head over to social media to get in touch. They can simply enter their details on the page they’re already on. Perhaps you have a great blog post and people want to see more content like that. All they have to do is look to the right and there they'll find your contact or sign up form. They hardly have to even lift a finger. This is such a simple addition that could really boost your signup rates in the long term. When people take the time to contact you, and get a helpful response from you, they're so much more likely to end up becoming your customer. So, an easy way to contact you is in everyone's best interests. 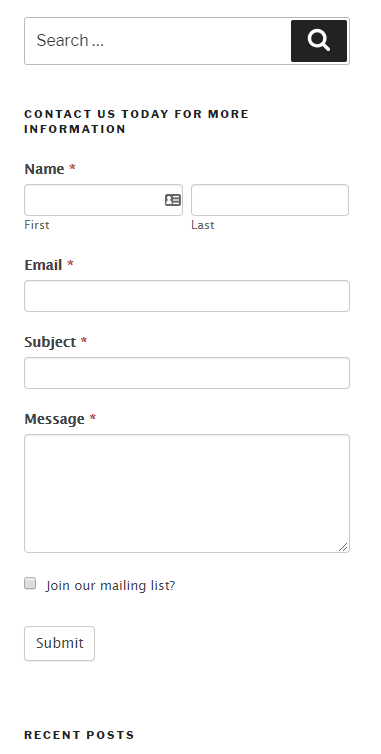 So, how do you add a contact form to a WordPress sidebar? Luckily, it’s really easy to do and yours will be up in no time. You don't need to know any code or specialized knowledge. It can all be set up with just a few clicks. The first step to getting a contact form in your side bar is – you guessed it – to create a brand new contact form. If you've already got a contact form ready and waiting, you can go ahead and skip to step 2. If you haven't added a new contact form, simply go to your WordPress admin panel and click on Formidable > Forms > Add New. From there you can either build your own from scratch, or use our handy Contact Us form template to save some time. For more information about how to create a new contact form, you can take a look at our post on it below. Once you’ve got your simple contact form created, you can then customize it however you want. If our template doesn't have all the fields you need, simply add in whichever you want from the list, or even take some away. This will take only a few minutes and then your form will be ready to publish and use however you like. You can also include this form on your Contact page or elsewhere if people prefer that way of getting in touch instead. The next step is to click on Appearance in your Wordpress panel. You’ll then get a list of options including Widgets. Click on that and from there you can manage all your Widgets, both sidebar and footer ones. You should see a list of all the available widgets you can use. Find Formidable in the list and click on it. This should pull up the option to add either to the sidebar or the footer. Choose sidebar and this will automatically add it to your sidebar list. On your right you should see a Blog Sidebar option with a list of all the widgets you have enabled there. If you click on the Formidable widget, it’ll expand and give you more options. 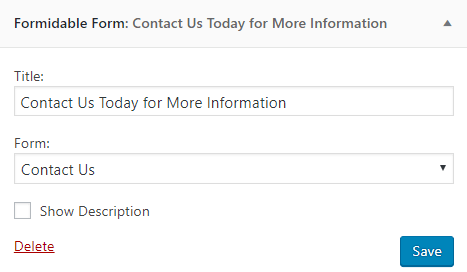 This is where you choose the contact form you wish to use in a dropdown. You can also add a title like ‘Contact us today for more information’. This will add the contact form widget to your sidebar. You can drag and drop what order you put the items in your sidebar, depending on how you want it to look. If you’re looking for an easy way to boost your email signup numbers, your contact form is a great place to do this. You can add a simple newsletter signup checkbox to the bottom of your contact form. This way, when people input their contact details, they’ve got an option to hear more from you in the future. This makes it effortless for them to signup, where they might not have even thought of it before. This is particularly useful for website visitors who really enjoy your blog posts and want a way to keep up to date with them. You can find out exactly how to do this by following our handy step by step guide on how to add a simple newsletter signup checkbox. It really is as simple as that. All it does is take a few minutes out of your day to set up. It's an easy way to save all your users plenty of time when they want to contact you. We hope this has helped you do more with your sidebar to increase conversions. This is an non-intrusive, simple way to encourage users to get in contact with you in a way that doesn't harm the user experience in any way. If you're not already using Formidable Forms, take a look at some of our fantastic features. All of which are designed to propel your website and business forward.